Paul Cézanne spent the last years of his life in retirement in his native Provence, painting the scenery and country folk around Aix-en-Provence, as well as executing numerous still lifes in the solitude of his new studio on the hillside known as Les Lauves. The artist had long ceased to regard painting merely as a means of representing the world and viewed it as an analytical process of exploring the structures of reality, for which nothing was more appropriate than still life. Although Cézanne’s interest in depicting inanimate objects is evident in the still lifes painted during his youthful years, which are still tinged with a certain amount of Romanticism, it was in the more experimental compositions of his mature years that he achieved greater mastery and confidence. 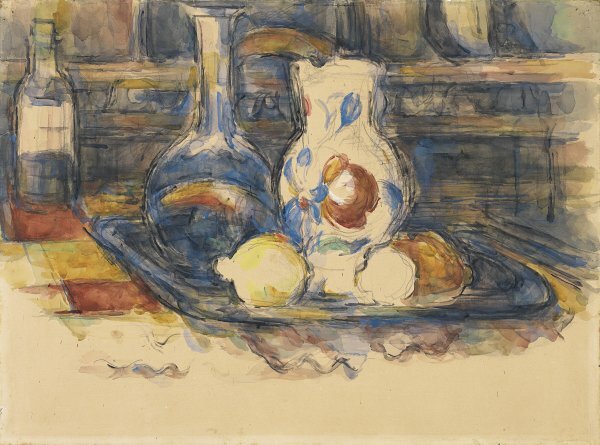 Bottle, Carafe, Jug and Lemons is among these paintings produced in the last years of his life, in which, as the British critic Roger Fry stated, “he achieved in still-life the expression of the most exalted feelings and the deepest intuitions of his nature.” On a tray lying on a table covered with a simple checked tablecloth is a small group of household containers of different shapes and sizes and two lemons (or possibly a piece of bread and a lemon, as Terence Maloon points out). The flowerpatterned earthenware jug in the centre — most likely crafted at one of the pottery works around Aix — stands out as a motif in its own right. There is a certain divergence between the diagonal perspective of the tray and slanting lines of the tablecloth and the play of horizontals and verticals in the spatial plane of the background wall. This creates a network of lines running in opposite directions and, at the same time, an effect of spatial unity, which heightens the emphasis on the two-dimensionality of the picture plane. 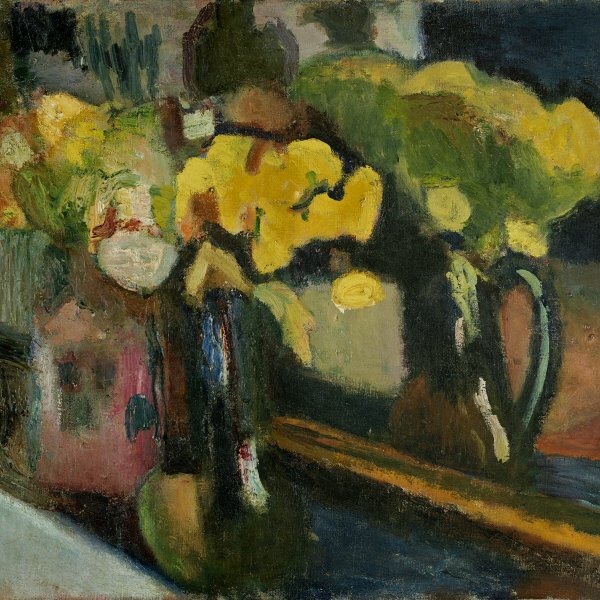 In 1904 Cézanne advised the young painter Émile Bernard to depict “nature by means of the cylinder, the sphere, the cone, everything brought into proper perspective, ” making clear that geometric shapes were essential instruments for capturing real-life experience. In accordance with this belief, Cézanne built this balanced composition from a number of volumes with well defined contours reduced to their basic geometric shapes. In addition, like the Impressionists, he replaced contrasts of light and darkness with contrasts of cold and warm colours. This still-life painting is furthermore a significant example of the skill the artist attained in watercolour, a difficult medium. Whereas the density of the constructive brushstrokes is similar to that found in Cézanne’s oil paintings, the transparency of the paint, which leaves the paper visible in certain areas, not only reveals the internal structure of the composition but allows him to accomplish visual effects with masterful harmony. The spatial arrangement and radical language of the watercolours dating from Cézanne’s final period constitute, in Fry’s words, a kind of abstract system of plastic rhythms, and foreshadow the Cubist still-lifes of Picasso and Braque.